Well it’s happened. Just as I’d expected, OneWordBirds has hit the bigtime. As of this writing, it’s sitting at staggering 53 likes on Facebook and 17 Twitter followers. I daresay it’s the most popular one-word-bird-focused blog on the entire internet1. Of course with this newfound popularity, the requests for specific bird articles have been flooding in. To date I have received over two such requests, and all three of them have been for the same bird. When it comes to pride and artistic integrity I pretty much have none, so in a transparent play to pander to my many adoring fans2, I give you: the Smew. No, it’s not the sound of a kitten sneezing. It’s a duck, and a fine-looking one at that. 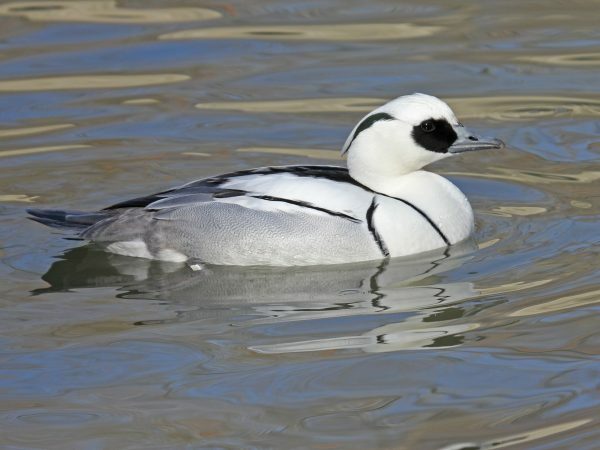 The male Smew is renowned for it’s “cracked ice” colour scheme of striking white, punctuated by black lines. It just may be one of the handsomest ducks in the world. The female, by contrast, looks like most other female ducks…which is to say boring. Sorry female Smew, it’s nothing personal. The name “Smew” seems to be a mashup of two old words from two different languages: the Dutch “smient” meaning wigeon and the German “schmeiente” meaning a small, wild duck. So basically, Smew means duck. Sometimes I think ornithologists just run out of ideas. Now at this point I find myself at a crux that I knew I’d face. Specifically, I’m 200 words into this post and I’ve already told you everything worth telling about the Smew. The truth is that although it’s a very nice duck, the Smew is actually pretty unremarkable. It swims like other ducks, it eats what other ducks eat, it breeds like other ducks, and if you live in the right parts of Europe and Asia, it’s fairly common to see. When it comes to the Smew, there’s not much to write home about aside from the way it looks. Fortunately for the Smew (and for me) most birdwatchers are shallow. As a rule, they don’t concern themselves with trivial things like what a bird does or how it lives – its biology is generally a lot less important than its appearance. Birdwatchers are visual creatures, and if you can’t see it with binoculars or capture it with a camera, it’s not likely worth considering. There is one thing, however, that birdwatchers prize even above physical appearance, and that thing is rarity. A birder will drive a thousand miles to see a little, brown sparrow if it has made the unfortunate mistake of showing up where it doesn’t usually live. Being endowed with the gift of flight, birds have a habit of doing just that. 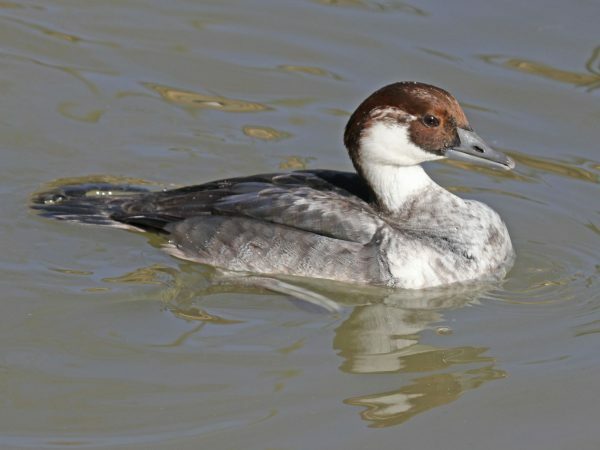 The Smew, in particular, is a frequent vagrant from it’s Eurasian home to other parts of the world, and birders flock to see it when it when it shows up. While you may think of birdwatchers as keen naturalists, many would be better described as collectors. This subcategory of birders is known as “listers” – a reference to the “life list” of birds that they maintain, and their sometimes obsessive habit of adding birds to that list. For some, the “ticking” of a new life list bird (or “lifer”) is more important than the bird itself, and they could just as easily be collecting license plates or postage stamps3. If you happen to be delving into the birding world, this peculiar habit of birdwatchers will reveal itself soon enough. Rare birds and wayward wanderers attract crowds of observers from far and wide. The phenomenon has been amplified in recent years with the advent of online bird reporting. Gone are the days of phone trees and hotlines, supplanted by Facebook groups and sophisticated citizen science websites. News of unusual sightings (referred to as “rarities” or simply “rares”) travels faster than ever and locations are precisely mapped, so finding these birds has never been easier. 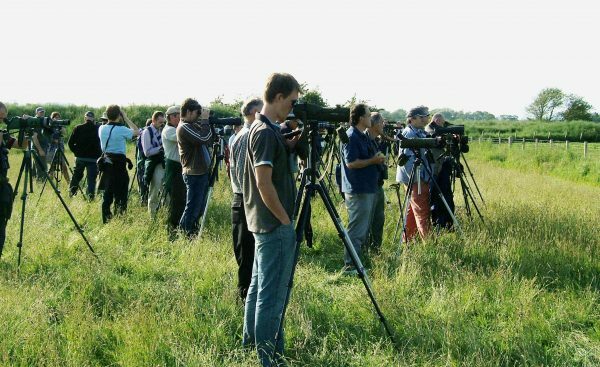 A herd of twitchers ticking a “mega” (really rare bird). There are both perks and pitfalls to the rise in popularity of this sort of birding. On the positive side, it gets people outside to enjoy birds, and the information gathered by these “twitchers”4 helps us learn about how birds move around. I used to do some twitching myself, and have plenty of fond memories. Back then we used email listservs. Oh the good old days. On the negative side, it’s not a very environmentally-friendly way to appreciate nature. The fuel consumption involved in driving great distances to see a single bird seems hardly justifiable, to start. On top of that, throngs of birders can place a great deal of undue stress on these often-compromised birds. And while a decade ago there seemed to be some unspoken agreement among birders regarding ethics, in recent years it has become much more common to see habitat destruction, bird harassment, trespassing, and even damage to private property. Now I’m not saying that everyone who goes to see rare birds is bad. It seems likely to me that a disrespectful few are causing the bulk of the problems, and I have to believe that there are still birders out there who care. But the impact is real, and the birder (and especially bird photographer) community is starting to get a bad reputation. There’s pushback too, as rare birds are increasingly not reported, and permission to access private property not granted. Is the bird already stressed or compromised? Some wayward birds are in rough shape, and the last thing they need is a horde of camera-wielding bird-chasers all up in their grille. Others are natural wanderers, and will likely make their way back to their homeland in time. Can I view the bird respectfully, without causing too much stress? Waterfowl are a good example of this – there’s a natural barrier between birder and bird, and the duck is free to retreat as it sees necessary. Roosted owls are the opposite, and are often cornered or harassed by birders as they try to sleep through the day. How far away is the bird? Everyone will draw their own line here, but it would be great if we could weigh our desire to see the bird against the environmental impact of doing so. Will seeing the bird require me to trespass, or damage private property? This should not need to be said, but it is immensely disrespectful to trample through someone’s flowerbed and into their backyard without permission. This happens more frequently than you’d imagine, and it has generated a lot of birder-focused rage in recent years. By performing a little assessment before you set out on your next twitch, you can make yourself a more ethical and bird-friendly birdwatcher. None of us are perfect, but we can all be better, and we should want to be. The birds and the non-birding public will be grateful. So the next time a Smew shows up in your neighbourhood, I wish you good viewing, happy ticking, and the peace-of-mind that comes with knowing you behaved like a generally considerate human being. Was I talking about a duck or something? 2Read “three people I know”. 3Once, while watching an extremely rare Western Reef Heron on a mud flat in Newfoundland, I was approached by a birdwatcher from Michigan. He plunked down his spotting scope, asked where the bird was, and viewed it for no more than five seconds. He made a quick mark in his notebook, announced that it was bird number 2863 (or something), and proclaimed that he had to get back to Michigan because it was his anniversary and his wife was unhappy about his last-minute birding dalliance. 4A twitcher is a person who chases rare birds. Supposedly it refers to the sort of agitated excitement that accompanies the process.